Here you can find ATEX-approved gas sensors for flammable gases (ex), oxygen and toxic gases for fixed mounting. These gas sensors vary by the type of gases they measure, functionality (e.g. analogue output, relay output) or the type of indicator - there are sensors with a built-in screen (as an indicator) or without. You can choose a gas sensor for almost any type of gas: methane, propane, butane, pentane, LPG, ethanol, ethylene, nitrogen, acetylene, benzene (lead), phosphine, oxygen, ozone, carbon monoxide, carbon dioxide, hydrogen sulfide, sulfur dioxide, chlorine, ammonia (sensors for other types of gases can be requested). Sensors without a display (series Xgard) are used in combination with an external indicator or a facility to detect gases, e.g. with the Gasmaster. Gas sensors that operate without internal alarm relay can be used in conjunction with the GasFlag distributor. The series of sensors Xgard, TXgard and Flamgard is always delivered calibrated and registered. By default, the sensor is delivered calibrated to methane. Please consult us for other types of calibration. 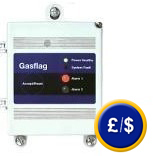 We offer the GasFlag for sensors without alarm relay. It is a small box for fixed installation without a display for signals for the input of 4… 20 mA. Its output has two alarm relays (max. 1 to 30 VDC). The status is displayed through the LED, and it is powered to 230 V.
The Gasmaster is a power station of gas detection with a large display. There are several versions: 1 and 4 channels as well as with or without an interface for the PC. The Gasmater also possesses an alarm relay with which light signals or ventilators can be activated. 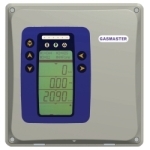 The systems of the Gasmaster and the gas sensors are delivered configured, calibrated and verified. Here you can find an overview of gas meters for the protection of humans. Types of gases to detect with the corresponding range of measurement (you will find the required order code for the types of gases in online store). By default, the sensor is delivered calibrated to methane. Please consult us for other types of calibration. The great advantage of infrared gas sensors is their long life (>5 years) and almost inexistent long-term drift. This grealty lowers the cost of calibration. In addition, the sensors have a full temperature compensation. The ATEX, IECEx and UL norms allow them to be used worldwide. Protection IP65/IP66 with cap resistant to inclement weather. You will find other gas sensord for CO2 at this link. Warning station without display to connect one of the above sensors. This unit is usually mounted on the wall. When it exceeds the threshold value, it emits an alert tone and flashes a red alarm LED. A relay output can, for example, be connected to an omnidirectional illumination. The response time of the alarm is less than 1 sec. Threshold values can be adjusted. The alarm station is almost always used with a gas sensor. When it is not desired then the sensor itself makes the indication, and the alarm sounds. Digital display and control panel for gas sensors described above. There are two Gasmaster models: GM 1 for a GM sensor, and 4 for up to 4 sensors (shows 4 values at one time). In addition to the standard analogue output, both types are available with an RS 232 data interface. The device also has relay outputs to activate a multidirectional light. The housing of the apparatus is protected against dust and splashing water. The unit is standardly equipped with a battery so it will continue operating in case of a power failure.